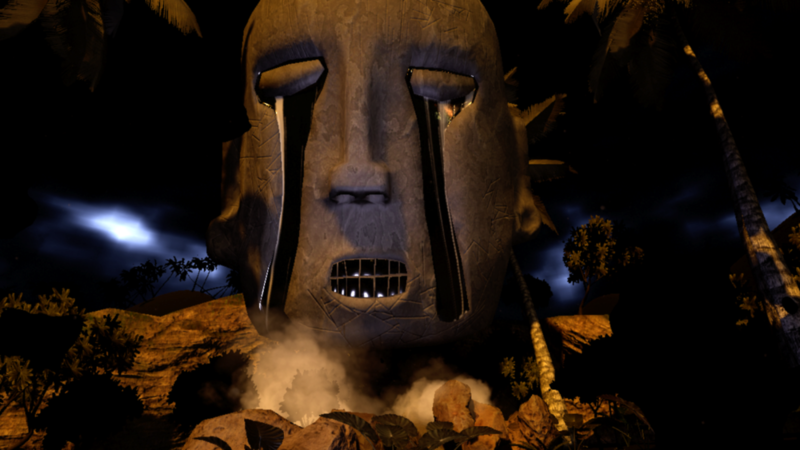 Boinayel is a virtual reality installation that places visitors within an ancestral dream. As visitors approach the installation, they encounter a large Vejigante festival devil mask and are engulfed by the sounds of Puerto Rico’s rain forests. Putting on the headset as thunder claps, they are slipped into an alternate dimension, experiencing a lush soundscape of music and forest sounds while standing face to face with ancient deities and a pair of mysterious figures atop a hill. Creating a short virtual reality experience and accompanying audiovisual installation in Unreal Engine and TouchDesigner, respectively. Designing two machine system for synchronizing installation with virtual reality environment so that user head movements affect installation sound and visuals. 3D modeling, sound design, music composition, and environment design.